x-config is installed on your Windows workstation using JAVA WebStart technology. You can click on the HTML link below for initial installation. The link points to a file that includes install parameters to initiate the installation process and to launch x-config on your workstation. When x-config is installed, an icon will appear on your desktop. After you click the “Install & Launch x-config” link above, select the "Open with" option on the displayed window to start the installation process. 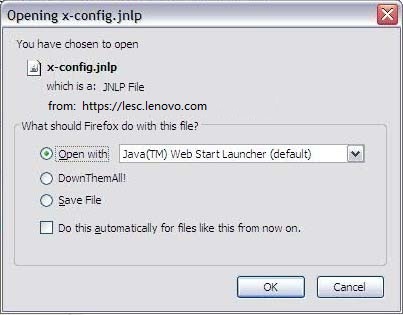 Then, select the “Open” option on the downloaded file (x-config.jnlp) displayed at the bottom of the page to start the installation process. When you click the “Install & Launch x-config” link above, x-config will be downloaded, installed and launched. When a user with an internet connection launches x-config through the link or the desktop, x-config will display a dialog box asking if the user wants to update the application if an update is available. Users should always accept the optional update when it is offered. In the Windows Control Panel, use the “Uninstall or change a program” command to remove the x-config installation.